ABC News quoted a recently released study from the Families and Work Institute that cited more than half of US employees regularly feel overworked or overwhelmed at their jobs. Not shocking. ABC’s own survey found similar results in March, with 26% of 1000 participants reporting that they felt they worked too hard in general, and struggled to stay engaged. Long hours were a big factor in overall burnout and dissatisfaction, which caused individuals to neglect their wellbeing, lose out on sleep, and feel generally more stressed and strained in their personal relationships. But we hardly need experts to convince us that difficulties at work negatively impact our health. Leaving your job is not the only option, and may not be a viable solution for everyone. So what behaviors can you avoid to alleviate the stress, simplify your workday, and ensure that you’re positioning yourself for maximum productivity? Committing to unnecessary meetings in the interest of looking busy or committed. But they wouldn’t have invited me to the meeting if I wasn’t required to be there! Often, that is not the case. A valuable employee is someone who can prioritize commitments in the interest of productivity and quality of work. The next time you’re asked to make a questionable time commitment, ask yourself – is it really critical that I put off other tasks to attend, or later can I spend 5 minutes catching up on the key points? If you are required to participate, consider the option to attend remotely, saving yourself a good chunk of time before and after that’s typically spent on idle chitchat, casual debates, or waiting for a cue to leave the room. Research shows that splitting up critical tasks into 60 to 90-minute blocks actually boosts productivity. Eating lunch at your desk and not taking adequate short breaks are some of the best ways to undermine those good intentions. 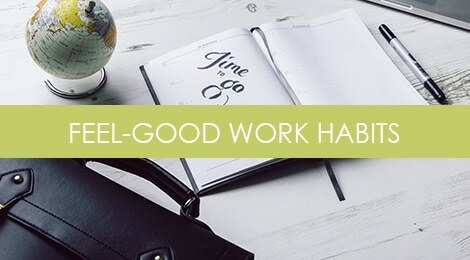 Go out, take a walk, or grab a coffee – you’ll replenish your energy and be more engaged in your work. Even if you prefer to bring your lunch, step away from your desk and enjoy it in the lounge, or outside on a bench. Not taking your vacation time. For many companies, vacation benefits and paid time off (referred to as PTO) are already factored into an employee’s compensation package. Not only does powering through and never taking a day off affect your wellbeing, health, and productivity – it’s also essentially leaving money on the table. Whether that’s true or not, you always want to be prepared with your latest credentials in the case of an open internal position, a great external opportunity, or unforeseen circumstances such as layoffs. I can’t tell you how many candidates I work with come to me at a point where the urgency is critical – and need to send their resume to a recruiter yesterday. Having your documents updated and ready to go will not only put your mind at ease, but it will give you a competitive advantage against other candidates. There are plenty of experts to whom you can outsource the task of creating impactful documents tailored to today’s hiring standards. Alternatively, set a time to tackle the project with a trusted friend or colleague. Declining productivity, bloated labor expenses, and employee burnout are some of the biggest challenges facing employers today. While some companies are working hard to shift towards a healthier, more engaged culture, we can still do more to ensure our own success and wellbeing. And doing so ultimately leads to better performance, more money, and increased career satisfaction.